Your challenge this week is to get in the habit of healthy meal planning, and creating a grocery shopping list so you don’t forget anything at the store each time you go. Each of the steps I list below isn’t rocket science, but I speak from experience when I say the habit of meal planning can be tough to begin and continue, because it actually involves many different habits. Are you new here? 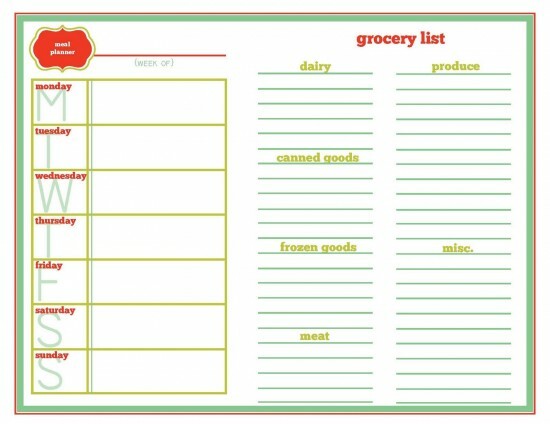 The Healthy Meal Planning And Grocery Shopping List Challenge is part of the 52 Week Home Organization Challenge. (Click the link to learn how to join us for free for future and past challenges if you aren’t already a regular reader). Now, don’t get discouraged if you haven’t done any or all of the above mentioned challenges. You can still domeal planning. You’ll just find it even easier once you tackle these other areas too, since being organized in them makes it easier to habitually engage in deciding your meals for the week. Before I dive into the steps of the Healthy Meal Planning And Grocery Shopping List Challenge, I also wanted to briefly discuss why I think planning your meals is such an important part of living an organized life, and why I included it in the Organized Home Challenge. We’ve all got to eat meals so it should come as no surprise when dinner rolls around and everyone in the family is hungry. Since this will happen whether you want it to or not, no matter whether you’re busy or not, my philosophy is it’s better to be prepared than to wing it, since at least preparation will make the process less stressful, and hopefully even pleasant. I hope I’ve convinced you to at least give healthy meal planning a try. However, I know I can only go so in-depth on this subject in one blog post. Therefore, if you want to learn even more I want to remind you about this excellent ebook on the subject, called Plan It Don’t Panic that I recommend. There are many different ways to engage in healthy meal planning, and none of them are wrong. All that matters is that whatever method you choose for the process works well for you and your family. Therefore, the first three steps of the Healthy Meal Planning and Grocery Shopping List Challenge are actually all the preliminary steps in helping you decide which method you’d like to choose for menu planning. The first decision to make is how often you want to plan meals, which impacts how often you go to the grocery store, and what types of meals you’ll be cooking (all fresh food, versus pantry and freezer staples, for example), among other things. Some of the main choices are weekly, every two weeks, or monthly. In addition, there is once a month freezer cooking, and cooking with seasonal food. If you’re new to menu planning I would suggest starting with the weekly plan. I suggest it for beginners, or those getting back into the swing of healthy meal planning because it is easier to plan for a shorter period of time than a longer one. You can always try out a new time span later if you wish to better suit your family’s needs and desires. The second step of this Challenge is to consider which meals and snacks you wish to plan for. For example, many people only plan their nightly dinners, and just buy a week’s worth of cereal and sandwich fixings for breakfast and lunch each week. On the other hand, others plan all meals, and also snacks for the week. Again, there is no right or wrong way to do it. Further, there is no reason why you can’t change how you do it at different times during the year, or in various seasons. For example, during the school year my husband and I tend to only plan dinners, with the idea that we’ll eat leftovers from dinner for lunch the next day (planned leftovers). However, during the summer when everyone is home all the time we consider all three meals, using both planned leftovers, and also cooking some breakfasts and lunches to mix it up a bit for everyone. Step 3: Decide If You Want Assistance With Meal Planning, And If So, What Kind? Finally, the third initial decision you will need to make as part of this Challenge is whether you want to have assistance with your meal planning, or you want to just do it on your own. There is no right or wrong answer for this decision either. Just what feels right for your family. This method is discussed more thoroughly below in Step 4. Even if you decide to use some assistance, however, you’ll most likely need to do some of these steps below anyway, to make sure you take into account the unique circumstances and scheduling issues you’ve got going on with your family. If you don’t like to think about what to cook, and would rather have someone else do the planning for you, you should consider using a meal planning service. There are many services available out there, some free and others paid. If you’re searching for one I suggest MakeDinnerEasy.com, who provides a free weekly newsletter which gives a meal plan and premade grocery list for you. Some people love to be told what to cook each week, where others don’t like it at all. They want to make the decision about what they’ll prepare and serve their family. If that sounds like you, but you’d like a bit of help to take the drudgery out of healthy meal planning, I would suggest an online meal planner, like Plan To Eat. The reason that online meal planning services, like Plan To Eat, can be helpful is because they can, depending on the program you choose, help you organize your recipes, plan your meals, and automatically create your grocery shopping list for you each week (Plan To Eat does all those). That can shorten the amount of time you actually spend on Steps 4-5 of the Challenge below, which can be a good thing if you’re short on time. Now that you’ve made these initial decisions, it’s time to actually make your meal plan. Obviously, if you’ve chosen to have someone else choose what meals you’ll prepare, you won’t need to do as many steps as if you’re choosing the meals yourself. To save yourself money, and not waste the food you already have, it is best to first take stock of what you’ve already got in your refrigerator, freezer and pantry, and try to use as many of the ingredients you’ve already got on hand as possible (especially the ones which may spoil if not used quickly). Your family is no doubt busy, as most are these days. That’s why it’s important to have a family calendar where you can keep track of all the activities everyone needs to do, and track everyone’s schedule. One of the best ways to save money on groceries is to use your meal plan to help you plan to buy food which is currently on sale, to the extent you haven’t already stocked up. For instance, instead of choosing to have chicken this week, because it sounds good, look at the grocery store circular and see what meat is on sale. If it’s beef instead, choose beef meals this week and save the chicken recipes for the week chicken is on sale. In addition, if you’re a couponer, you should use this time to also determine which items you’ll add to your menu based on the good deals you can get this way. Taking all of those factors above into consideration, now it’s time to choose which recipes and meals you’d like to cook as part of your meal plan. This is where many people get stuck, but here’s my suggestion for getting unstuck. Look at your organized recipes, particularly the group of recipes you’ve already tried previously and know your family enjoys, to get ideas and inspiration for what you can choose to make now. Further, if you’ve got a stack of recipes you’d like to try, choose at least one to work into the meal plan so you can try something new. 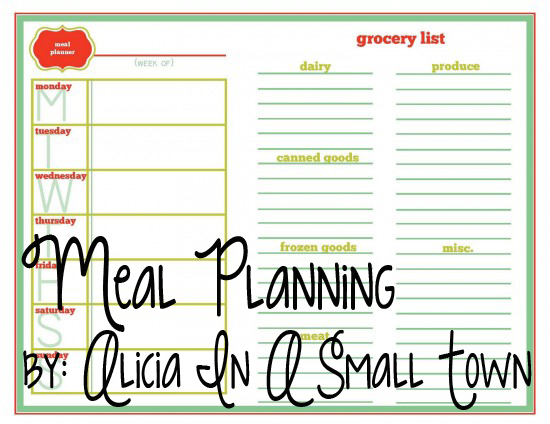 Finally, write your meal plan down on a calendar, a piece of paper, or whatever else you want that you and your family can reference throughout the week (or other time period you’re meal planning for). Be sure to also write down on your calendar what, if anything, you need to do ahead of time for preparation for any of these meals. For example, if you need to pull meat out of the freezer to thaw, or start a crock pot meal in the morning, make a note of this to make sure you don’t forget to do these time sensitive tasks when they need to get done. Use your recipes and meal plan you’ve created in Step 4 to make your grocery list, which is Step 5 of Challenge. Filling out your grocery list shouldn’t be difficult once you’ve created the meal plan, since you just need to jot down any ingredients you need to make the meals you’ve planned that you don’t already have in your home. At the beginning of this article I explained some of the benefits I’ve found from meal planning. However, I’ve found that people give up on healthy meal planning because they get thrown off from their plan, and therefore find it unworkable. While I understand getting off track with meal planning, because that has happened in our family quite a number of times, we’ve always gotten back on the horse, so to speak, with the process because it seems to work well for us. However, I’m convinced one of the reasons it works well for us is that we’re not too rigid about it. Life happens, and sometimes you don’t feel like eating what you had planned, or someone gets sick, or is running late, and you’ve got to make changes to your plans. In fact, I would say it is a rare week that we don’t tweak our plan somewhat during the week because of changed circumstances. Make your meal plans flexible enough that you can switch things around a bit on the fly and you’ll still be benefiting from your plan, without worrying about having to stick to it no matter what happens. I hope that you’ve enjoyed week 8 of the 52 week home organization challenge, and I hope you found it useful! Let me know how your meal planning is going, and make sure to join me next week!